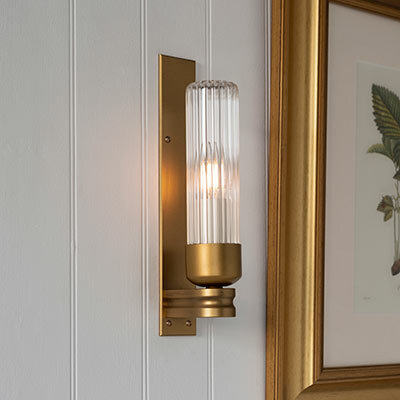 Our lovely vintage style Raydon Wall Light oozes with an industrial chic that harks back to the 1940s when modernism was in vogue and designers were looking for new ways to make products with an emphasis on simplicity and function. With its slightly opaque, tubular, fluted glass shade and plain flat edges, our Raydon certainly has a personality that is reminiscent of the factory lighting schemes that prevailed during the interwar years. Hand crafted from high quality steel that has been painted a deep, aged gold colour, it would look lovely either side of a bathroom mirror. Our Old Gold finish is created by coating the metal in dull, old gold powder paint which is gently antiqued by hand to give it a richer, deeper look that will bring a touch of luxury to any traditional or contemporary setting. To find out more on all our finishes, check out our product finish page. The Raydon is rated IP44 meaning it is suitable for use in bathroom zones 2-4 - anywhere except directly above or alongside a bath or shower. For more information, please read our guide. It has a small bayonet fitting and we recommend our LED Clear Candle Bulb as the perfect accompaniment. It is also available with plain glass and can be frosted on request. Fitting Option: can be supplied with E14 (Small Edison Screw) fitting for Europe. Please call us for information.